Carolyn See (born Caroline Laws; January 13, 1934 – July 13, 2016) was an American educator and critic. She was the professor emerita of English at the University of California, Los Angeles. See was the author of ten books, including the memoir, Dreaming: Hard Luck and Good Times in America, an advice book on writing, Making a Literary Life, and the novels There Will Never Be Another You, Golden Days, and The Handyman. She was also a book critic for the Washington Post for 27 years. See died on July 13, 2016 in Santa Monica, California from cancer, aged 82. ↑ "Caroline Laws, Born 01/13/1934 in California - CaliforniaBirthIndex.org". www.californiabirthindex.org. ↑ "Carolyn See Biography - Carolyn See comments:". biography.jrank.org. ↑ Rourke, Mary (14 July 2016). 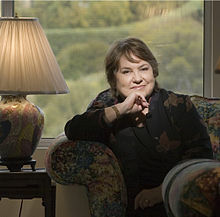 "Carolyn See, award-winning Southern California writer, dies at 82". Los Angeles Times. Retrieved 15 July 2016. This page was last changed on 15 February 2019, at 15:36.